The utility program mutate_bases can be used to mutate bases in nucleic-acid-containing structures (DNA, RNA, and their complexes with ligands and proteins). It has two key and unique features: (1) the sugar-phosphate backbone conformation is untouched; (2) the base reference frame (position and orientation) is conserved, i.e., the mutated structure shares the same base-pair/step parameters as those of the native structure. The mutate_bases program was created in response to repeated requests from 3DNA users over the years. Written as a standalone ANSI C program, it is on a par with other major 3DNA components (e.g., find_pair, analyze, rebuild and fiber). The program was first released as a supplement to 3DNA v2.0, and then became an essential part of the v2.1 release. Overall, mutate_bases has been designed to solve the in silico base mutation problem in a practical sense: robust and efficient, getting its job done and then out of the way. The program can have many possible applications: in addition to perform base-pair mutations in DNA-protein complexes, it should also prove handy in RNA modeling and in providing initial structures for QM/MM/MD energy calculations, and in DNA/RNA modeling studies. The five fields per mutation can be in any order or CaSe. Multiple mutations specified per line are separated by ';'. Now let's take advantage of the web to illustrate the key features of mutate_bases using a set of worked examples. The scripts and corresponding data files & images are attached, so you can repeat the procedures in order to have a better understanding of how the program works. In our GpU dinucleotide platform paper, we reported a previously unnoticed intra-dinucleotide sugar-phosphate H-bond that is unique to the GpU platform. This O2′(G)···O2P(U) H-bond readily rationalizes the over 60% occurrence of GpU over other platforms (e.g., ApA and UpC). Moreover, this H-bond has recently been validated by state-of-the-art quantum-chemical techniques. In this section, we will use mutate_bases to answer the questions of (1) why GpU, not GpT? i.e., why the GpU platform is RNA-specific? (2) why no UpG platforms observed? i.e., why the GpU platform is directional? The GpU platform (1msy_gu.pdb) is derived from PDB entry 1msy. 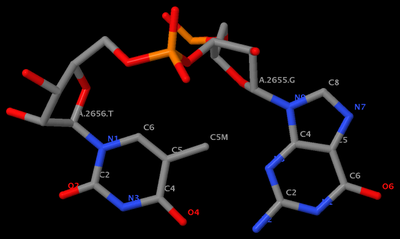 The figure below shows the identity of the two nucleotides (G2655 and U2656 on chain A) and names of the base atoms. With the above command, we mutate U (which is residue #2656 on chain A) to T (see figure below). Clearly, the methyl group of T protrudes into the pocket, causing steric clash. Thus GpT is incompatible with the platform conformation. Using the above command, we mutate G (which is residue #2655 on chain A) to U, and U to G simultaneously. That's what the plural 's' in mutate_bases stands for. From the figure below, one can see clearly that no intra-base H-bond is now possible, consistent with the fact that no UpG platform has been observed. mutate_bases -l mutations.dat 1msy_gu.pdb 1msy_ug2.pdb. 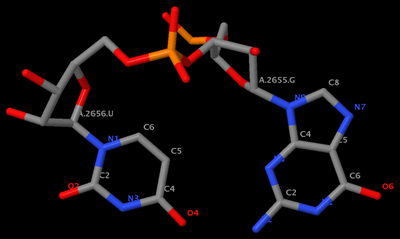 The two mutated PDB files, 1msy_ug.pdb and 1msy_ug2.pdb, are identical. You can run find_pair and analyze to the raw and mutated PDB files and verify that they indeed have the same base-pair parameters and backbone conformation. Note all the images used in this post were generated using Jmol. 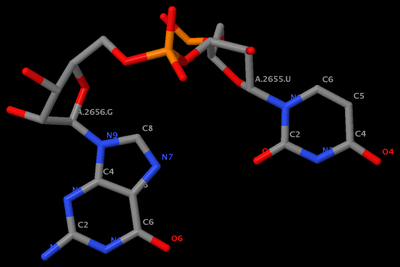 As much I like RasMol (v2.6.4), I am now gradually switching to Jmol and PyMOL. Single quotes in mutate_bases command-line option have been replaced by double quotes so that the program also works in native Windows. See follow-up messages below. It is a Windows peculiar again! Try replacing single quote with double quote in the mutate_bases command again, and it should work. I've just tested the following example. Since double quote also work in Linux/Mac OS, I'm refining the help message to use double quotes instead of single quotes. Thanks for using 3DNA on Windows. Did you read the diagnostic message? The -e option may help. Just follow the example. Report back how it goes. Dest the list contain a nucleotide with chain id 'D' and residue number of '2', as you originally specified? Now does the above message make sense to you? As a new user of the program, what would you suggest to make the message clearer?